We’re confident in the quality of our craftsmanship. That’s why we offer a one-year guarantee on everything we sell. If your ABCOGEAR product rips, buckles or otherwise fails to live up to its potential during your first year of using it, simply return it to us and we’ll replace it. Our one-year guarantee covers any abnormal deterioration (threads unraveling, materials tearing, rivets loosening, etc.) due to defects or substandard construction for one full year after the purchase date if you use our products as they were intended. For example, if a rivet comes loose causing your tool belt pocket to break open while you’re in the middle of installing some drywall, you’re covered. 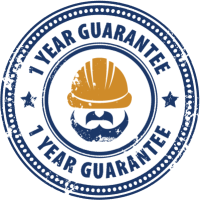 Naturally, our one-year guarantee doesn’t cover the normal wear and tear that you expect from using our products as they were intended. It also doesn’t cover any deterioration that occurs from misusing our products, using them for reasons other than their stated purpose, or putting them through disproportionate amounts of stress. In other words, driving a steamroller over your tool pouch and then returning it to us would be a bad idea. If you are returning a product that failed to live up to our one-year guarantee, we’ll need to confirm you are the original purchaser. So, do us a favor and tuck that receipt away somewhere safe and easy to remember for the next 365 days. If you find yourself in the unfortunate position of actually having to use it, we’ll do our part and make sure the whole exchange goes as smoothly as possible. If you receive the wrong order or your product arrives damaged, give us a call at 1-844-605-5900. We’ll do our best to work out all the details and make sure any extra shipping costs associated are either covered or reimbursed. If you made a mistake when purchasing, don’t hesitate to call us right away so we can correct your order before it ships. Even better, review your order carefully before hitting the confirmation button. If you are unsatisfied with your product for any reason after it arrives, and you want to return or exchange it, we offer a 30-day money-back guarantee as long as your item is postmarked for return within 30 days of the date you received it. Returns or exchanges will only be honored if the product is still in brand new, unused condition.